Welcome to our From the Heart January Blog Hop. Well even though this is not the first I created for 2014, it's still my first DT posting for 2014!!! So lets get the hop started!!! Didn't you just love her color combination!! Oh she is AMAZING!!! if not why don’t you start on the From the Heart Stamps blog, so you don’t miss anything. Now doesn't he look like had to he is just having a blast riding that Toboggan!?!?! I created my own sentiment, to express the excitement of the ride, using Cosmo Cricket Tiny Type Stickers. Love have alpha stickers around...You just never know when you will need them. Thanks for hopping with us today. The hop will end on Monday January 6th at 6am, EST. Winners will be posted on the From the Heart Stamps Blog on Wednesday, January 8th. Love how you embellished the image. The hat is so fun! The hat cuff is my favourite! is that enamel dust? Love the colors you used for this fun card. I really love the colors, the image, everything! A great card to start the year! Love your card Calypso! The paper is great and I love the wooden snowflakes too! I'm having such a fun blog hoping. Another super cute image. Love your card. What an adorable card. My favorite part is the Whee! Just makes me smile. Oh my goodness.....this is beyond adorable!! I love the colors and that cutie snowman is having too much fun! That is just soooooooo adorable!!! Girlfriend, when it comes to coloring, YOU ROCK!!! Great job! Happy New Year to you and yours!!! Just the sweetest Calypso! Love how you've showcased the adorable image. Love the sparkly trim too on his hat! Love it! Hugs! Cute image, great doily paper and the sentiment made me smile. What a fun card! I love the colors and that glittery stuff on his hat is great as are the other embellishments you used!! Just love it! Oh my, what a cute card! 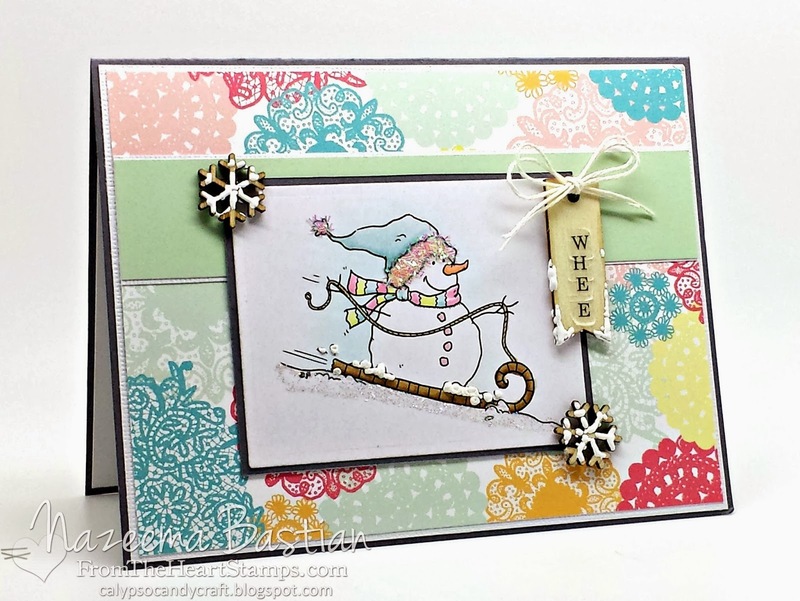 Love the pretty paper, the fur on the snowman's hat and those adorable wooden snowflakes! Wheeee! This is such a fun card! Fantastic paper and sentiment! This is so cute, love all the special touches! Super FUN card! Love your coloring, that awesome sentiment is perfect for this guy, and you layout is perfect! TFS! This is a very fun snowman, your card is fantastic! That card is so cute!! I love the accent colors you used on the hat. Adorable card! Very nicely done....great colors and details. Adorable is right...How do you do it...time after time! Nice job! This is super cute! I love the soft colors, Liquid Applique, and all the other little details!